Luau Bar Mitzvah Theme Party. Luau Party Bar Mitzvah. No matter what the season, everyone will love the warmth of a Luau Bar or Bat Mitzvah party. What better way to celebrate this milestone occasion than with wonderful music, delicious food and favors that will make your guests feel like they just came home from Hawaii!? Great parties start with great invitations! After you've sent your formal Bar or Bat Mitzvah invitation, send a fun invitation for your party. Or include it in the envelope with your formal invitation. With a Luau party there are lots of different styles available. Choose a colorful, completely personalized luau party invitation. Your guests will feel the fun as soon as they open the envelope. Since this is a once in a lifetime party, spice up the invitation a bit - mail your party invitation rolled in a mailing tube and include a flower lei. A fabulous photo ticket invitation in a tropical color is another way to go and will make everyone believe that this is one party not to be missed. For a really memorable invitation, why not use a custom caricature invitation? Customize it with a picture of your child on the beach surrounded by luau items and dressed in a grass skirt. This great image can be used for welcome signs, a sign in board and centerpieces too. As your guests enter the party, have the Bar Mitzvah boy or Bat Mitzvah girl there to meet them. A personalized life-size cutout of the guest of honor (remember the caricature invitation?) is the perfect way to welcome everyone. Set palm trees on either side of your cutout. (You can rent these and they are so great, you'll want to get a few and spread them around the room!) A basket of leis, or better yet, someone to hand them out, should also be right near the door! While they’re standing there meeting and greeting, be sure to offer tropical drinks! It doesn’t matter whether you’re serving traditional cocktails or a special palm tree punch, adults will love having their beverages in a coconut cup. Add a grass skirt to your seating card table - a small extra with big impact. It will look great! It’s always fun to add a little extra pizzazz to the dance floor. After all, no beach party or Luau would be complete without beach balls. Scatter brightly colored beach balls around for guests to toss back and forth. Don't forget a limbo contest. Reward the limbo winner with genuine maracas. Be sure to have extras because all your guests will want them. No Bar Mitzvah or Bat Mitzvah would be complete without glow necklaces. There are as many ways to decorate your tables as there are colors in the leis. Bright tables with great accessories will make whatever you serve taste even better! Centerpieces can be as simple or as elaborate as you choose. Make a centerpiece from tropical fruits – pineapple, kiwi, mango and papaya – surrounded by colorful leis. It’s basic but will look great and can become a wonderful fruit salad when the festivities are over. A bouquet of tropical flowers is always a great choice. 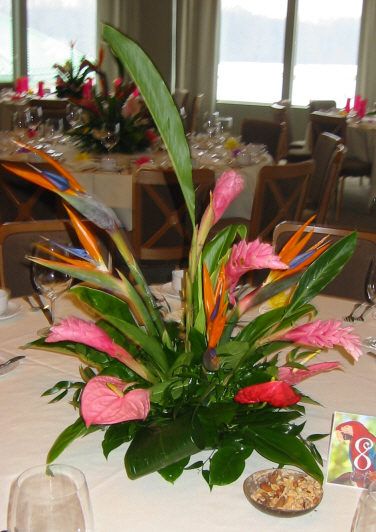 Here's a picture of a centerpiece we used at a Bat Mitzvah luau. How about a pinata for your centerpiece? They are available in a huge variet of luau styles. Choose linens in an assortment of bright colors - lime green, magenta, yellow and turquoise work great! You can mix them around the room and alternate napkins in the same colors. Brighten the night with bamboo tiki candle holders. Or, instead of candles, choose personalized mini tabletop lanterns with your child's photo on all four sides. The all come with LED candles and look great surrounding a centerpiece. A beachcomber hat also makes a wonderful centerpiece. Hire a balloon company to make and attach balloon bouquets to the top of them. You can even turn the hats over and fill them with chips or candy that your guests can snack on throughout the party. Don't forget to scatter seashells around the center of the tables. Raffia skirts are a must at any Luau! If your guests don’t want to wear them, why not use them for table skirting? Cover the buffets or bar tables with grass tableskirts. They will add a perfect touch of island flavor. Memories of special times with friends make wonderful souvenirs, but sometimes it’s nice to have a tangible favor too. Everyone will feel totally cool in beachcomber hats. These hats will appear everywhere, no matter what the weather! Everyone loves chocolate. Delicious milk or dark chocolate candy bars covered in a luau theme candy bar wrappers guarantee a sweet end to a fabulous party. Pass them out when guests are leaving or scatter them across the tables. Or try a luau theme personalized mint tin - pass them out at the end of the evening or have one at each place on the dinner tables. Aloha! Congratulations on having a memorable Luau and Bar or Bat Mitzvah - From the Party Girl!